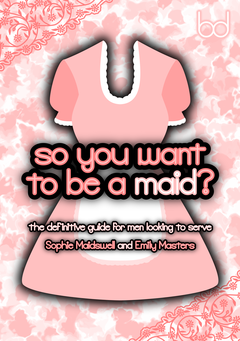 so you want to be a maid? how do I tell my wife that I want to be her maid? how do I persuade my girlfriend to let me do her chores? how do I introduce a new partner to my desire to wear an apron? how do I find a mistress who'll make me do her cleaning? how do I become a male maid for the woman next door? how do I avoid making mistakes that might ruin my chances of being a maid? how do I write a personal advert that women will respond to? how do I stay safe and successful as a male maid, both online and in person? how do I ensure I'll be invited back to serve as a maid again and again? Sophie Maidswell has served as a male maid for many mistresses over the years, learning the hard way what works and what doesn't when it comes to catching a woman's attention. Throughout so you want to be a maid?, he shares his first-hand experiences of serving in a variety of situations, presenting a step-by-step approach for each that will help get your own career as a submissive maid off to a flying start! Detailing techniques that have worked successfully for him, as well as discussing what can go wrong and how best to avoid such problems, Sophie's expertise in this area is second to none. His perspective is complemented by that of Emily Masters, who shares her wisdom about how women feel about men who want to be maids, together bringing you a book that contains everything you need to know about finding a mistress.